More and more companies and organizations discover advantages of the development of iPad applications for their business. iPad is an ideal tool for impressive interactive corporate presentations, intelligent sales enablement tools, reporting tools and e-learning solutions. DTT is one of the best developers of iPad applications in Amsterdam. What makes us so special? We have an experienced team of developers, we can quickly identify the possibilities and impossibilities of your iPad app idea, we can develop an iPad application of any complexity. In addition to developing an app for the consumer market, we are also able to develop in-house solutions. We make our commitment to apps with a clear user interface and inspiring look and feel. For more information about the iPad apps we have already developed, please check our portfolio. Before developing an iPad application, one should decide upon the main goal it would fulfill. Will it be an app for entertainment, will it alleviate the work of employees, will it help in your business promotion or others. This is a very important step and that's why it is very important to have a wise and experienced adviser such as DTT. We have developed a lot of iPad applications of various levels of complexity and different functionalities. Among our clients were governmental organizations and individuals, big and small companies. An app is a serious investment and one should consider all the solutions that lie in front of him. How to see it if you are a newbee? DTT is there to help you in this difficult decision making process. Our talented designers can create a professional preview of your app that wil give you an idea of look and feel of your app, of the functionalities and design pecilarities. This is just awesome - we haven't even started developing an app, but you already have a clear concept of it! Our experienced team of user interface designers strive for the ultimate user experience. The user is therefore in the centre of the whole development process. For pre-development phase, we take plenty of time, in order to guarantee a certain quality. This saves us a lot of valuable development time. Below we will list you some of the iPad apps we have already developed, for you to have a notion of what kind of app developing company we are. - A bright orange app was specially made for ING to support ING Marketing day. This app enhances team spirit, generates more commitment from employees and adds a fun factor to the corporate life. The ING Marketing day app has several levels. During the introductory rounds - teams present themselves and get acquainted with each other. Then comes the knowledge quiz with funny and interesting questions. Third stage - marketing awards round where teams have to complete several polls. Each level has time limit which present an additional challenge to the teams. The team who got the biggest score wins. The game was made for in-house distribution and had a big success among the ING stuff. Check the ING reference for our work. - We have developed an OSR app - an app which allows you to explore the night sky using Augmented Reality. Just point the camera of your iPad into the sky and discover various constellations and stars visible in your region. That's cool, isn't it? But we made it even more interesting! Give your lover or friend a gift that he/she will remember for ages. A star in the sky - what can be more romantic than that! With OSR app you can purchase a star and name it after a special event or after your beloved one. With OSR app you can easily locate the star and surprise your partner with an outstanding gift. 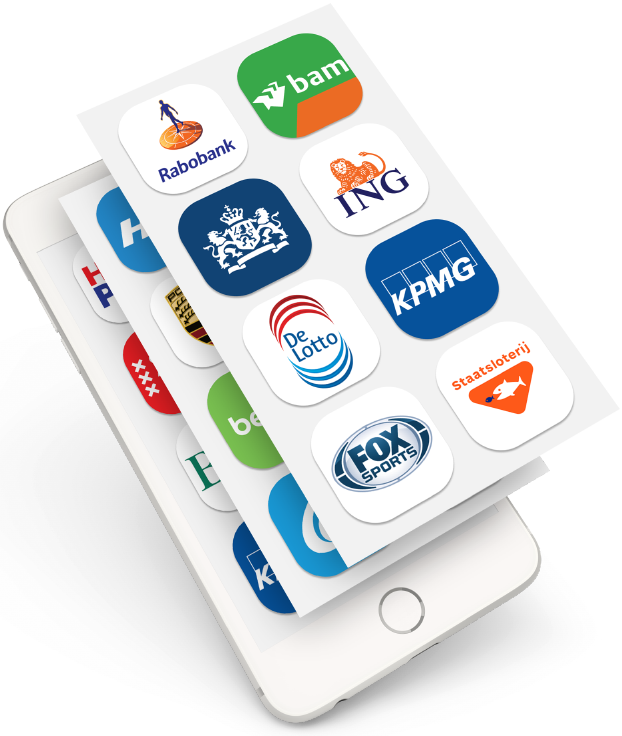 - For KPMG we have developed 2 apps for corporate use. KPMG Fine II app and KPMG Fine app give an overview of the risks connected with international laws and regulations. The client completes several surveys and on the basis of the results, the client and the consultant can develop an optimal strategy to avoid the risks. DTT was responsible for the design and devlopment of the app as well as for the server solution and CMS. To understand the current app market and especially your potential competitors, our dedicated marketers will perform market research. You can learn a lot from your competitors, learn from their mistakes and to notice things they do well. By combining this knowledge with a distinctive and unique design, you can outplay your competitors. Thus you will have a comprehensive understanding of opportunities and threats for your app. If you still doubt about the development of your application - please make an appointment and visit our office in the centre of Amsterdam. We have a parking place for you and a cup of an excellent coffee. During our first meeting we will identify the goal and purpose of your app, short-term and long-term. With our extensive experience and expertise we can give you a quick insight about the chances of your app idea. If we get to the agreement, we will devise a proposal for you. The development proposal includes the following components: market research, UI design (workflow), total concept, technical documentation and a precise and modular established budget. DTT stands for quality. We are result-oriented, we work towards a high-quality final delivery. In our communications we are open and transparent, a deal is a deal. You can expect a clear expectation management from us. At DTT, we do not strive for the 'quick wins', rather we aim for a lasting cooperation. We will provide you with information throughout the entire process of app development. Our project managers are always easily accessible, both by phone and through the mail. If you want to know more about the possibilities for developing an iPad app, please contact us.